Yes, this sounds about right and highlights the fact that you must always seek to place bets at the highest odds you can find. If you are still into experimenting why not have a look at the underdog to win at half-time – some very surprising results in that market – especially the away underdog performs extremely profitably in most leagues, although you’ll need to factor in the winning and losing streaks to get a real focus on this market and to calculate a suitable progressive staking plan. Backing favourites in any market is always a recipe for disaster as they are invariably underpriced, meaning long-term losses in most leagues you can analyse. Hi, I have been reading your website in an effort to teach myself about probability and I am really enjoying the insights you present, so thank you very much! To be honest, I really had no idea home games were so heavily weighted towards the home team, I had always assumed it was only a 33% chance with the 3 possible outcomes, but with all the data I have looked at so far you are spot on – it is around 45%. To test what I have learnt I just did a quick model of historic data from the 2013-14 EPL season and if you betted $1 on every home team to win ($380), with Ladbrokes returns you would be up 96c at the end of the season. Does that sound about right to you? I forgot to mention:back draw when villa plays home,back draw when everton plays away,back draw when fulham plays away. You have a real nice yield! I assume the “system” works in long term due to the fact that you probably contribute to balance the bookie and keeping each bet relativly small, so you will not affect the market or the bookie to much? I order to spread your risk you need to play a pretty large and diversified portfolio. You also never use your whole bank in one betting round. This automatically reduces the amounts for each bet to relatively small stakes. For example, you have a bank of 20,000 units, and you risk 20% per betting round –> meaning you are risking 4,000 units. Your betting portfolio consists of around 100 bets, which translates to a risk of 40 units per bet. These kind of amounts certainly do not affect the market. However, to be honest. 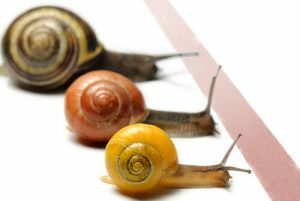 Income from betting is a very slow process. There are seldom more than 3 betting rounds a months = 4,000 x 3 = 12,000 turnover. If you are lucky you’ll achieve a 10% Yield on average, meaning 1,200 units per month. But there will be months which produce a deficit, so you have to look at the whole year. There is an article and also course in preparation on this topic. Just keep checking. We will also certainly email the news when it’s available to everybody. Thanks for your comment. Yes, at the time of writing we used an assumption that odds at Betfair were prima facie around 10% better than traditional bookmakers and guided people towards using betting exchanges to guard against bookmaker account closures for showing signs of success. With any potentially profitable system, you must always seek out the best odds and oddschecker.com and oddsportal.com are invaluable resources. Only by finding the best possible reward for the hard work you have already put into finding a system will you ever be able to maintain the ‘value’. We use a combination of bookmakers and exchanges and spread the bets across many markets to stay under the radar but we don’t just monitor the English Premier League and neither do we just back the home team. Yes, the system makes a consistent profit which fluctuates between 4-35% yield on a successful betting round – the trick is definitely to play every round of matches AND to find the best odds for each match, which although time-consuming is ultimately rewarding. This is based on historical data and you have found that it would have been profitable playing home team. But you have also assumed that the odds at betfair is 10% better. Have you verified that it is possible to get 10 % better odds for those matches that you have been analyzed. Many times the odds can be lower at betfair compared to traditionally bookies and your profit will be gone! My thesis is that if you found a profitable window, by “simple” statistical analysis, this value-bet vill eventually be gone and your system will be losing money! By the time you and your fellows start to increse the turnover for this bet, the market will respond and give lower odds. Has it been profitable playing whole 2012? You’r welcome 🙂 I have been looking and reading some of your aricles and i found it to be very interesting and coherent, in particular the value evaluation. Just for fun, i tried to reproduce your results for Backing Man Utd at Home to Win by plaing 10eur. on each of their 19 games and i came up with a profit of 72eur., instead of your 100eur. It’s quite a big difference so i suppose i am doing something wrong with my calculations… could you give any clues to why this is happening? it’s possible that you are using a different staking plan, and/or also different odds. We used for our calculations Ladbrokes odds which we increased flat by 10% to take the overround out. The staking plan used for the calculations was a fixed risk 10 units, meaning the stakes varied depending on the odds, the loss was fixed. Excellent work! I just don’t understand why you only take into account 190 games per season… shouldn’t it be 380 since every game is a home game for someone? Excellent work! Is there anywhere to see this same system applied to the 2011-12 season? Please check out the German version of this article. There is a comment which includes an Excel spreadsheet for download from AsaNisiMasa who has followed these predictions in the 2011-12 season and made a 20% profit of his investment. Hi folks, please pay attention. 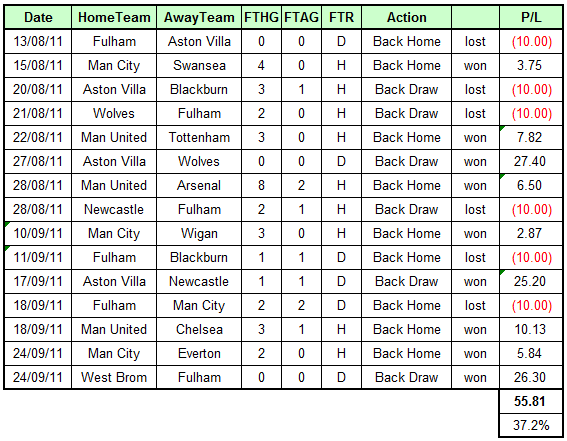 Soccerwidow’s forecasts here are perfect 🙂 If one would have simply bet on the 4 recommended teams (Fulham, Aston Villa, Man City and Man Utd) without thinking too much last season, one would have landed a 20% ROI! I have to recommend Soccerwidow to all and have donated a small ‘thank you’. I wish everybody fun reading this blog and/or following the recommendations. 1. Fracsoft is certainly the best, but you’ll have to pay for the data. 2. 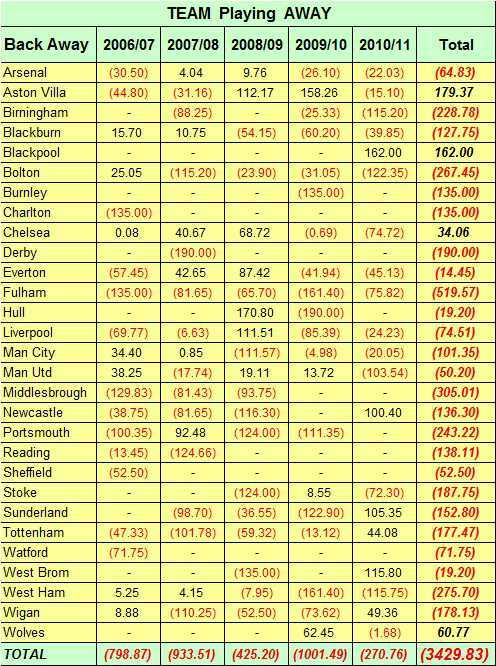 You can also download from Betfair historical data in Excel format, but I find it a bit messy. pd: i have clicked mistakenly on delete post on the above post , dont delete my post please! Hi Soccerwidow, you make the calculation based on ladbrokes odds , data from excel from football data uk , and you put 10% higher (attempt to imitate betfair odds) i know it. You say laying away on premier league its profitable but i have see many odds today , i see many examples that at high odds , betfair odds is greater than ladbrokes odds and difference more than 10%. So , my question is , do you know a site with historical data of truly betfair odds? 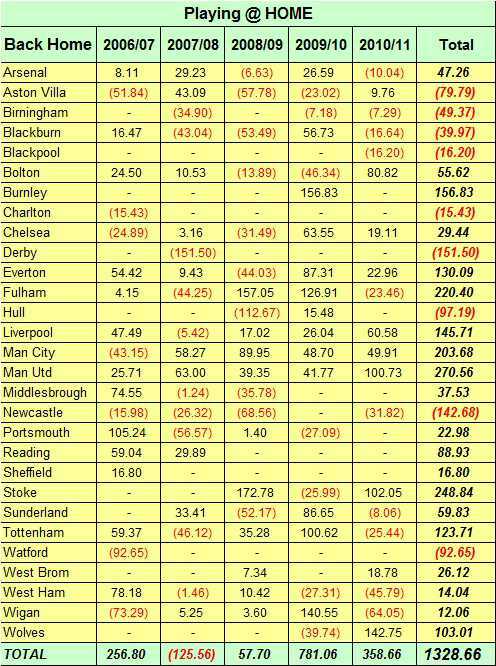 football data uk don’t have betfair odds , it would be useful to attempt make a strategy . For all who are too lazy to check this prognosis themselves and calculate if it was correct herewith a table for you to download the results. If one calculates only the 6 losses as ‘investment’, then the ROI (return of investment) is 93%!